Two of my kids are starting new schools this year. We, as a family, are finally done with elementary school and my youngest will be starting middle school with vastly more kids than before. My middle daughter has finished middle school so her brother will have it to himself; she will be starting high school with her older sister. My oldest is always the pioneer, having to figure out the ins and outs of a new school on her own, and then pass that knowledge down to her younger siblings. I remember how stoic she was when she started preschool, and how we worked in kindergarten for a “no tears” drop off the first week of school. Her teacher rewarded her with a trip to the prize box! 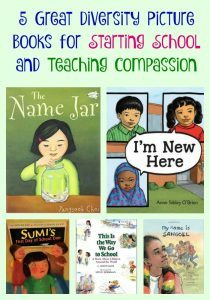 Whether your kids are starting a new school or not, I think these diversity picture books can help develop empathy for new students in their class. It can also open a window to geography and social studies by connecting something they know — the experience of going to school — with new countries and cultures. This book makes me tear up. With poetic prose, it shows three three children from different countries starting over in America where they struggle to learn a new language and make new friends. Slowly but surely, they connect with their classmates and the jumble of sounds that they hear start to sound like recognizable words. With each small act of bravery, they participate in class and, in turn, find a friendly face that reassures them that they have a place here in this classroom and this community. Add this diversity picture book to your pile to read to kids as they return to school. It will help them develop empathy for their peers. A new school is a scary place but especially when nothing is familiar. Sumi’s teacher is a wonderful example of helping a new foreign student transition successfully. She monitors how the other kids are interacting with her; Sumi can understand how people feel about her even though she doesn’t know what they are saying. There are also activities that bridge a language barrier. Sumi’s draws a picture and plays on the playground. And it turns out that making a new friend doesn’t have a language barrier either. Sumi makes a friend on her very first day of school ever, and now school is not-so-lonely, not-so-scary, and not-so-mean. The war in Sudan forces Sangoel’s family into a refugee camp and then to America. Only his grandfather, the old one, stays behind, but he assures Sangoel that his name will keep him connected to his proud Dinka heritage. At age eight, Sangoel is the man of his family, playing a big role to help mama and his little sister settle in. Everyone in America, it seems, has trouble saying his name correctly. He corrects them softly, but he’s sad that he seems to have lost his name. Should he change his name to an American one? But what of his connection to the old one? Sangoel has an idea to teach his classmates his name inspired by his new soccer jersey. So much is lost when children leave their homeland, and often their names are difficult for Americans to pronounce or remember. This picture book and the one that follows show the struggle for kids who immigrate to keep their connection to the place that they have left, while trying to forge a new life. Sometimes, their name can be that bridge that helps them find their place in both locations. Unhei is excited and nervous about starting her new school in America She studied English diligently in Korea, and can speak it proficiently. The kids on the bus, though, can’t seem to say her name correctly which makes her embarrassed. She tells her new classmates that she’s choosing a new name for herself and everyone helps by giving her suggestions on slips of paper in a jar. As she considers new names, she turns to her name stamp given to her by her grandmother for comfort. When it comes time to introduce herself at school, a letter from her grandmother convinces her to keep her Korean name. It turns out that, with practice, everyone can say her name correctly. It’s a new friend that helps Unhei realize that her name is special, though he probably doesn’t realize what a big role he played in her decision. By pointing out how Joey’s actions affected Unhei’s decision, readers will realize how small acts of kindness lay the groundwork for friendship and acceptance. Kids might think that children in other places get to school the same way their do, whether it’s walking, biking, taking a bus or getting driven like in my neighborhood. But some children get to school by skating, subway, skis, train, ferry, trolley car, helicopter, and even radio! This rhyming picture book explores both the United States and the world beyond including Italy, Egypt, Norway, China, Israel, Switzerland, Kenya, Australia, India, Mexico and Siberia. It’s a fun way to realize that getting to school can be very different depending on where you live and it can start a conversation geography and other cultures. p.s. Pair This Is the Way We Go to School with What The World Eats by Faith D’Aluisio and photographed by Peter Menzel to look at the photo essays on what these kids might eat for breakfast for a glimpse into different cultures. You could also pair this book with Doyli to the Rescue by Cathleen Burnham for a nonfiction picture book about a girl whose family rescues baby monkeys in the Amazon. She goes to school by way to two canoes. I hope you enjoy these books with your kids. What books do you like for helping your children transition to school? Thanks for your suggestions!